Well, there you have it. I figured this would be coming. 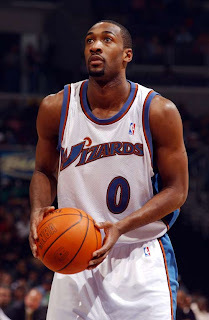 After bringing his unloaded guns to the Verizon Center in an effort to play a joke on one of his teammates, Gilbert Arenas of the Washington Wizards has been suspended indefinitely by NBA commissioner David Stern. According to Yahoo! Sports, Stern wasn't expected to make the decision of suspension until after the investigation of this incident by federal and local authorities was through. However, at a Philadelphia game this week, Gilbert made gestures with his index fingers, pointing them at his teammates as if they were guns. I guess Stern felt that Gilbert was making light of the situation and decided then that Gilbert would be suspended. He shouldn't have done it. Period. Whether it was a joke or not, he shouldn't have done it. I'm not trying to preach. Just trying to be real. I love reading about celebrities, love doing these stories on them. However, they all have got to realize (and a lot of them do), that with their celebrity status, they have become ROLE MODELS. People do look up to them, and will copy their actions. This mistake by Gilbert Arenas can make other people, kids even, think that it's cool just to tote guns around and use them for anything. I'm not saying banish guns, but people shouldn't use them unless they are ABSOLUTELY necessary to defend your life or the life of your family. And definitely not for a joke. It's in bad taste. And it also makes the NBA as a whole look bad. I mean, here you have one of the NBA's star players playing around with guns like it's nothing. It's just not a good look. So I have to say, I think that he did deserve the suspension because guns is definitely not a laughing matter. He should've known better, but hopefully he has learned from this situation and will think before he acts next time around. WALE ON THE MO'NIQUE SHOW!!!!!!! Glee Gets Picked Up For A Second Season! Michelle Williams Set to Star in Chicago!